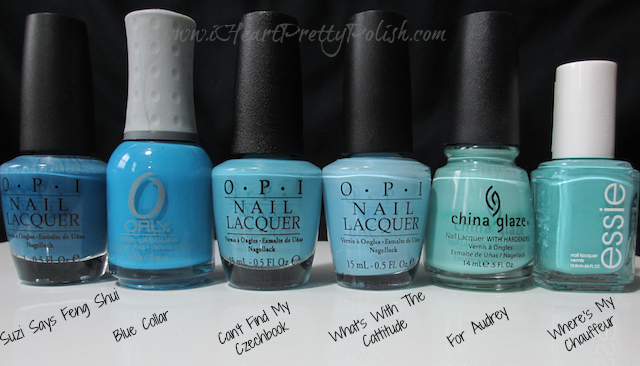 iHeartPrettyPolish: OPI Can't Find My Czechbook Comparisons - No Dupe Here! I'm happy I took that plunge. As soon as I got home I pulled out some of the colors I thought would be dupes and they were all too green/teal. It was actually closer to Orly Blue Collar, which is a straight-up blue. Can't Find My Czechbook is just more of a muted blue with a tiny bit more teal than Blue Collar. I swatched a few more colors so you can see the differences between them. I know some of them aren't even close, I just wanted to show you how it compares to some of the other colors you may have. Hope this post helped in some way:) Let me know if you think you have a dupe. You may be surprised that you don't. Check out my manicure using Can't Find My Czechbook here. Where is my checkbook? I need that color. I just realized your wheel swatches are the perfect ombre colours! I can't resist blue polish. I will definitely be getting this one! Where did you purchase it? I found it at Ulta. I love blue polish too! I've been waiting for comparisons of this one. Thank you for comparing so many. Now I need to go buy this one. Thank you so much for this comparison, Essie!! Just confirms that I NEED this color!!! Yep. These are the posts that I look for so it's nice to provide it to others. That is one of the polishes from the collection that I was eyeing! Thanks for swatching, you just inspired me to pull the trigger. :) Cool. Go get it! Great comparison post! I'm sure I need this polish! Lol, nice! Those were many of the dupes I was worried about! Great post :) I was worried about the teal/aqua dupes but it definitely seems to be more blue! Thanks for the comp! Although I have 4 of the shades swatched, I am convinved that I in fact NEED OPI CFMC. LOL, yep, you sure do! I just ordered this one yesterday, I can't wait to get it! I can't wait to see it on you....and what you throw on top! It will be interesting to see what people find for dupes. Thanks for posting this, I hate when I accidentally end up with a dupe. And you wound up with a cute skittles mani! Yes, I did didn't I? I know, I hate that too. I was pretty pleased when I couldn't find a dupe at home. I hope you don't have a dupe. Enjoy! I wonder how similar the new sinful colors sugar rush is.. I'll take a look. I haven't seen that one yet. Thanks for the great post, this was really helpful. I think I'll be picking up this color. I noticed that you have OPI What's With The Cattitude, which has been a lemming of mine for a while. I was wondering if you knew of any dupes that are reasonably priced, because $30 on Amazon is a bit out of my price range! I will check in my stash and she what I have that is the closest to it. There are lots of people that want that polish so it would be great to find a dupe! I will do a comparison post. It has been nearly 2 years since this post....have you found a dupe for OPI What's With The Cattitude yet? It has been on my lemming list for a long time and I have had no luck getting it but would love to find a dupe until I can get my hands on it.